Herod seized an opportunity to control world trade by building a seaport on Israel's coast, where the sea routes and the predominant land route intersected. Caesarea was a glorious city, covered with marble, and symbolizing the vast wealth that Herod accumulated by dominating world trade. 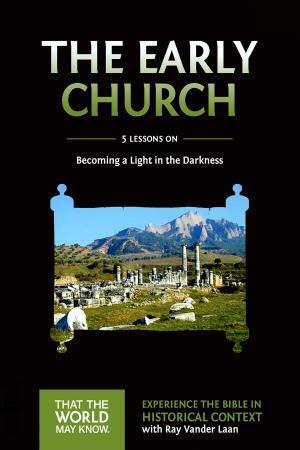 The Harbor, named Sebastos (Greek, Augustus), revealed Herod's determination to become the greatest Near Eastern King. 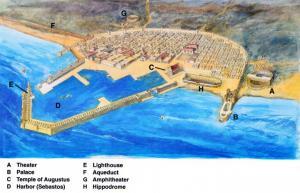 No natural harbor existed, so Herod constructed a 40-acre harbor using two breakwaters. The south breakwater was 600 yards long, and the north breakwater was 300 yards long. The base for these breakwaters was built of 40-foot by 50-foot concrete blocks that were poured under water at depths up to 100 feet, and the towering lighthouse at the harbor entrance could be seen for miles. Located on its own peninsula, the palace included a small port so Herod's visitors could enter the palace without having to go through the city.Its pool:115 feet long, 60 feet wide, and 8 feet deep,extended into the salty Mediterranean Sea, yet it most likely held fresh water. Herod welcomed his guests with luxurious rooms that included a large dining hall, hot and cold baths, and a semicircular colonnade that extended out into the sea. The theater was located outside of the city, probably because the vulgar and obscene performances that took place there were so offensive to Jewish residents. The theater played a vital role in promoting Hellenism, a people-centered lifestyle that glorified human knowledge, accomplishment, and experience. Positioned so that prevailing breezes provided amazingly good acoustics, the theater could hold about 4,000 spectators, who sat on stone benches.